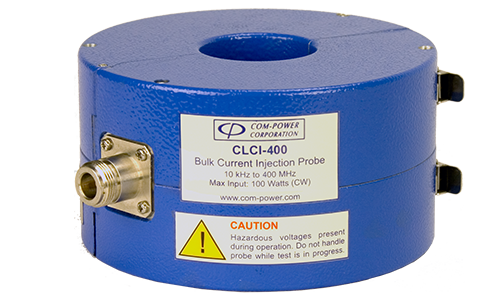 Com-Power's Current Injection Probes are used for RF conducted immunity testing per IEC 61000-4-6, CISPR 16-1-2, RTCA DO-160 and MIL-STD 461. Current injection Probes are to be used only when there is no commercially available CDN for the type of port(s) to be tested. The principal use of the probe is to inductively couple large amount of RF current into the cables of the Equipment Under Test (EUT) to determine its susceptibility. When choosing a Current Injection Probe the most important feature is the internal diameter or "window". This window must be able to accommodate the cable and wires under test. The probe incorporates split-core ferrites into its rugged, circular enclosure, and is hinged; thereby allowing the probe to be opened on one side in order to easily place the wire, cable(s) or cable bundle(s) to be tested into the probe window, making it much more convenient to use than other non-split core probes. Current probes are calibrated through the use of a calibration fixture with a coaxial-type arrangement. 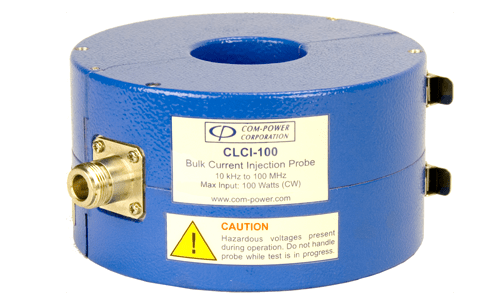 The fixture allows the probe to be clamped around the center conductor, while the outer conductor encapsulates the probe on four sides, so that the transmission line characteristics are not compromised. This fixture is available separately.